We put 9 of the best backpacking knives to the test. From chopping veggies to whittling wood, we used these knives throughout our backpacking trips and daily lives while performing a series of rigorous tests. Our all-around top pick is the Spyderco Delica 4 for its perfect balance of compact design and durability. The ESEE Izula II won the day for heavy-duty and survival usage. 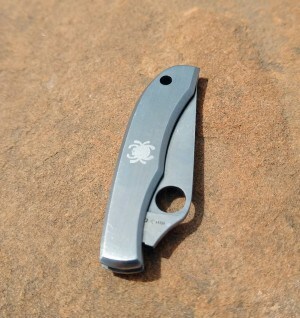 For lightweight backpackers, the Spyderco Honeybee is a remarkable knife for its size and easily the best ultralight backpacking knife we tested. The classic Opinel No8 is our best value pick and an incredible knife for the price. 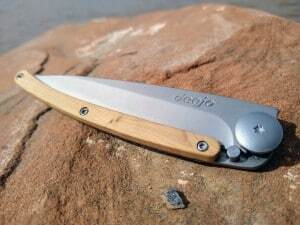 Finally, the Deejo Wood 37g won an honorable mention for its beautiful design and high-quality blade. Read on for our full reviews and tips on how to choose the right backpacking knife for your needs. Note: If you’re looking for knives you can use while camping and aren’t as concerned about weight, check out our guide to the best camping knives. 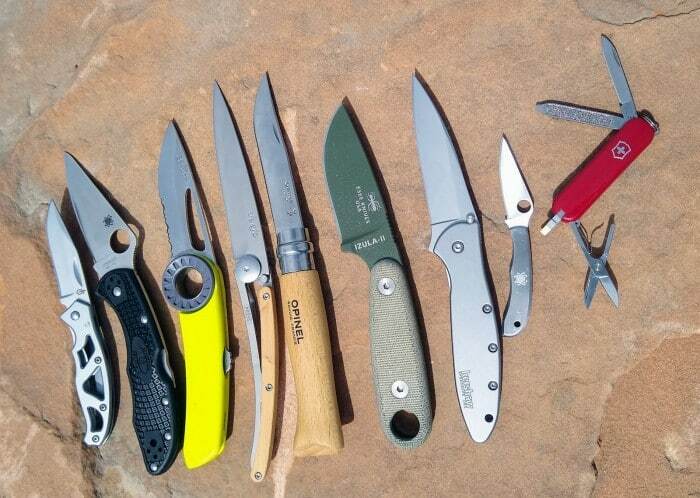 The nine backpacking knives we tested. The Spyderco Delica 4 blew us away in nearly every aspect of our testing. This knife combines a light weight of only 2.5 oz with a razor sharp blade and a remarkably comfortable, solid grip. The Delica 4 opens and closes smoothly, and its thumb hole makes for easy one-handed opening. The knife feels extremely solid and well made. It was one of the sharpest knives right out of the box and sliced through a sheet of paper like butter. When it came to whittling wood and boring holes, the short blade and raised thumb notch made this knife feel easy and intuitive for detail work. No other knife in our test felt as precise and solid in-hand as the Delica 4 (although the Izula II was close). After our tests, we couldn’t detect any noticeable change in the sharpness of its blade. It was also hands down the best in our test at starting a fire with a fire starter. The sharp edges on its spine struck a spark with little effort and left no wear to the knife itself. We couldn’t find many drawbacks with the Delica 4. One minor one is that its short blade wasn’t the greatest for slicing food. We’ve seen this knife on sale at many online retailers. If you shop around, you can likely find it for substantially less than its $120 MSRP. It’s still an investment, but if you want to buy one backpacking knife that you can use on every adventure, the Delica 4 is it. 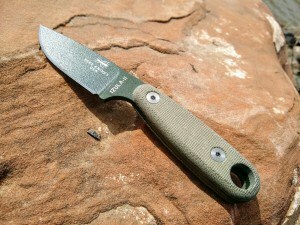 The ESEE Izula II was the only fixed-blade knife in our review. It’s designed for wilderness and survival usage and made by Randall’s Adventure and Training, which started as a jungle survival school in the Peruvian Amazon. In other words, this knife is legit. Its blade wasn’t the sharpest right out of the box, but it was the thickest and most durable. It even held up to some mild batoning (splitting wood) without chipping or wearing the coating. It’s no camp hatchet, but it’ll do in a pinch. If you get the Izula with the handle and sheath, it’s a touch on the heavy side for backpacking. One of the beauties of this knife, though, is how customizable it is. The handle is easy to remove, leaving you with a barebones knife of only 2.2 oz. The sheath adds another 0.8 oz. Even without the full handle, the Izula was comfortable to hold. A simple paracord wrap made it even better. A lighter, more practical handle for the Izula II. The MSRP is a little steep, but we’ve regularly seen the Izula on sale in the $60-$70 range. All in all, we were impressed. If you’re in the market for a fixed-blade knife that’s light enough for backpacking, capable in survival situations, and fun to own, this is your knife. The Spyderco Honeybee packs a lot of punch into a tiny package. In our paper test, it was one of the sharpest knives we tested. It was one of the slower knives in our cutting speed test, but that was mainly because of its tiny size. The blade still sliced easily through 2 feet of cardboard. The Honeybee was capable of whittling wood, although it was awkward and hazardous due to the lack of a locking mechanism. Still, it can get the job done if you really need it to. It was able to strike a spark on a ferro rod, though not easily and with noticeable wear to the back of its blade. We pushed this little knife into much more heavy-duty use than it was intended for. While it did show some wear and weaknesses, it was more capable than we expected. It’s far from the easiest knife to hold. The handle is slick, and combined with the minuscule size, it requires a careful grip. For weight-conscious backpackers who recognize that a knife is still an essential part of their kit, or for anyone who wants an ultralight backup knife, the Honeybee is a sweet little piece of gear at a great price. 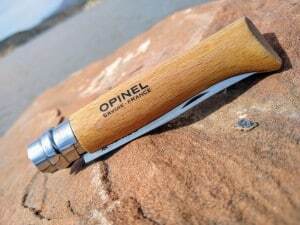 Opinel is a French knife that’s become iconic. For only $15, this is an incredible knife. Its 3.35″ blade was the second longest in our test and gave it a lot of cutting power. Although it wasn’t super sharp right out of the box, it held up to all of our cutting tests surprisingly well. We could cut through a length of cardboard much faster than with some of the sharper knives. We loved slicing and chopping food with the Opinel. The Opinel uses the unique “Virobloc” safety lock, where a metal ring twists to lock the blade either open or shut. We loved its simplicity. You could easily see when the lock was engaged, and it felt safer than some of the frame locks. As we were whittling, we noticed a little bit of play in the blade. It tended to move back and forth against the lock slightly, though not enough to bother us. The Opinel No8 is our best value pick, but it doesn’t feel or perform like a budget knife. It’s a capable tool, worthy of adding to your backpacking and camping arsenal. The Deejo Wood 37g is a sleek, lightweight, and well-designed knife with an amazing blade. It wasn’t the sharpest knife in our test, but it more than made up for it with its long blade. It excelled at slicing through…well, pretty much anything. Paper, cardboard, vegetables, cordage, the Deejo made quick work of it all. Because of its minimalist design, the Deejo Wood 37g initially felt a touch flimsy. It impressed us with how durable it actually was, though. The blade wasn’t as stable as the Delica 4 during tasks like whittling wood or boring holes, and we could feel a small amount of give in the handle. But it was nothing that had us concerned. It didn’t play well with a ferro rod, taking 10 strikes even on the blade to light our tinder. Those are minor shortcomings for a knife that is lightweight, compact, functional, and beautifully designed. In our testing, the Leek was the sharpest right out of the box. It sliced through a sheet of paper like nobody’s business and excelled at food prep. Its assisted open is sharp and snappy, and the frame lock felt solid and reliable. The tip lock that holds the knife closed is a nice added safety feature. The Leek was the heaviest knife in our test (not counting the ESEE Izula II, which could be customized for lighter weight). While we loved its performance and solid feel, it would be hard for us to justify dedicating 3 oz in our pack for it. The slick handle also wasn’t the best for tougher tasks that require a precise, stable grip. Overall, this is a great pocket knife with an extremely sharp blade. While the MSRP is on the high side, it’s frequently on sale for less. We think its design, style, and weight make the Leek better suited to everyday carry than the backcountry. Though it can hold its own in most backpacking tasks. The Leek’s secure sliding tip lock. The Petzl Spatha is our top pick in our guide to the best climbing knives, so we wanted to see how this lightweight, affordable knife held up to backpacking tests. Compared to the other knives in our test, it’s just…decent. It didn’t handle whittling or fire starting as well as most of the other knives we tested, nor was it the sharpest or quickest at cutting. We did really love the large carabiner hole for clipping the knife to our packs for quick access. 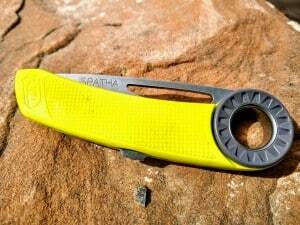 If you already have (or plan to buy) the Spatha for your climbing gear, it can capably double as a backpacking knife. If you’re buying a knife specifically for backpacking, we recommend the Opinel or Deejo, which are a similar weight and price point, over the Spatha. We’ve had our share of cheap knock-off “Swiss Army Knives,” so when we opened up the real deal, we were absolutely amazed at the quality. The Classic SD’s blade is razor sharp. Despite its tiny size, it made short work of 2 feet of cardboard in our testing. When it came to anything beyond basic slicing, though, it just didn’t hold up. We did manage to get a fire started. Striking the back of the blade with the knife closed eventually produced a spark, but it started to melt the plastic. Striking the blade itself gave us sparks, but we stopped pretty quickly to prevent damage to the thin blade. The Classic SD handled cutting thin cordage really well. However, cutting or carving wood, chopping veggies, and most other camp tasks were awkward at best. The Classic SD could also be called a multi-tool. In addition to the blade it has scissors, tweezers, a toothpick, and a nail file. Throughout our testing, we just never found an instance where we needed the scissors or file and couldn’t just as easily use a knife. Overall, this is a great little tool for carrying around town and having on hand. For backpacking, though, we found that its tools weren’t super useful, and we preferred a larger, more capable blade. 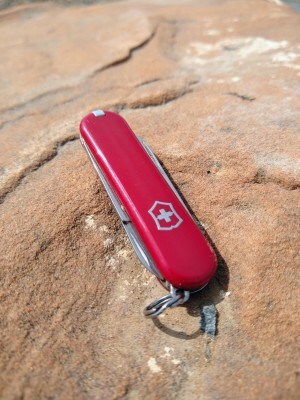 99Boulders owner and editor Alex Beale has used the Victorinox Swiss Army Classic SD as his pocket knife and ultralight backpacking knife for nearly two years. The knife is a solid option for ultralight backpackers with minimal needs, he says. But it’s incapable of any heavy duty cutting work. On backcountry trips he mostly uses the blade for opening food packages and the scissors for cutting his nails. These days he keeps the Classic SD on his keychain for simple everyday tasks and takes it with him on short backpacking trips. Alex’s well-worn Classic SD has a permanent spot on his keychain. 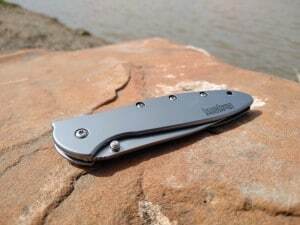 He also takes it with him on short backpacking trips as an ultralight backpacking knife. 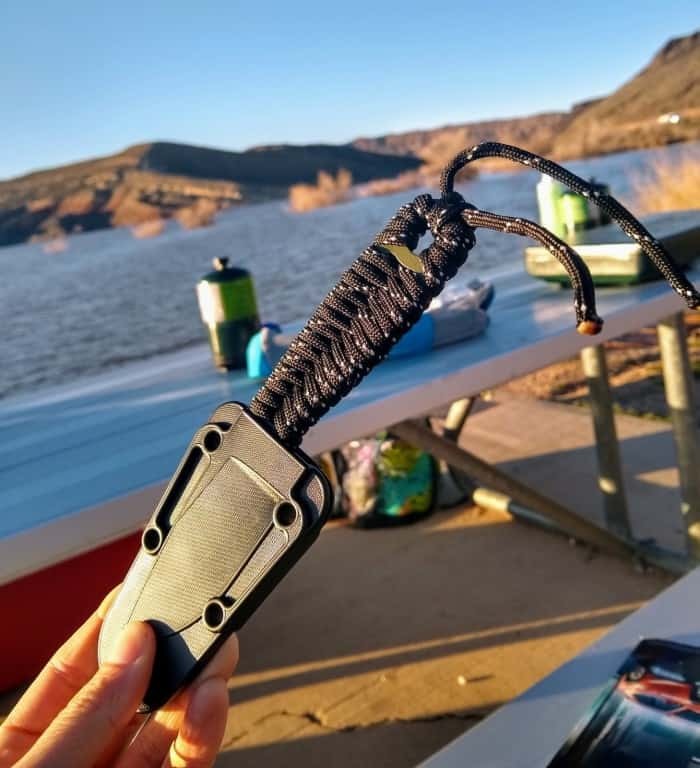 We were stoked to test the Gerber Paraframe Mini. Its low price point and light weight made it seem like a shoe-in for our best value pick. Unfortunately, it didn’t hold up. Right out of the box, the blade was by far the dullest. In our paper test, it did more tearing than cutting. In our cardboard cutting test, we were basically ripping the cardboard rather than cutting it. It was also the least comfortable knife to hold. It’s a small knife, and we don’t expect it to be as comfortable as knives with a more generous handle, but it never felt stable in our tester’s hands. The lock was also surprisingly difficult and awkward to release. Its compact size is an advantage, but for a budget backpacking knife, we’d choose the Opinel No8 over the Gerber Paraframe Mini. Folding – Most backpacking knives are folding knives. They are compact and don’t require the added weight of a sheath. Fixed Blade – Although heavier, quality fixed-blade knives can be stronger and more durable than folding knives. A good full-tang knife (where the steel of the blade extends all the way to the end of the handle) is a simple, virtually indestructible tool, ideal for heavy duty or survival usage. Folding backpacking knives can be compact and lightweight. Most knives are made from steel, but there are hundreds of varieties out there, each with its own unique characteristics. It’s beyond the scope of this article to describe all the varieties, but it’s worth taking a minute to research a steel type to see if its qualities suit your needs and usage. In general, softer steels will shape easily into a razor sharp edge and will be easier to sharpen, but they tend to be less durable and lose their edge quicker. Harder steels, on the other hand, are more durable but harder to sharpen. A lock that holds the blade in the open position adds stability to the knife and prevents it from slipping closed onto your fingers. Frame Lock – A piece of the frame will slide over behind the blade to hold it open. This frame lock is pressed to the side with the thumb to release the blade. These allow for one-handed closing of the knife. Liner Lock – Similar to a frame lock, here a small metal liner inside the frame holds the blade open. It is pushed to the side to release the blade. Back Lock – A piece of metal along the back of the handle holds the knife open. It is released by pressing on the back of the handle. 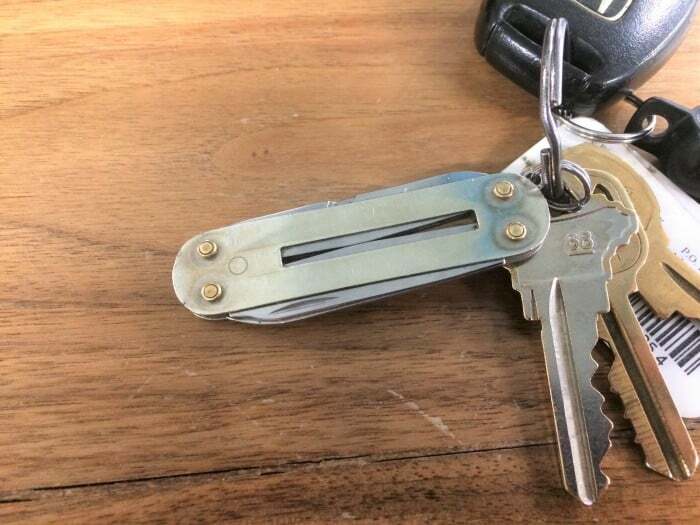 This type of lock can be very stable, but it requires two hands to close the knife. Other – Some manufacturers have unique methods of locking a blade open or closed. For example, the Opinel No8 uses a small ring of metal to block the blade from closing, and the Kershaw Leek uses a tip slider to hold the blade closed. No Lock – Many small knives don’t have room for a locking mechanism. Using a knife with no lock requires extra care, and these knives generally won’t feel as stable. If you carry a fire starter (aka ferrocerium rod) backpacking, the ability to strike a spark with your knife will be crucial. Some knives are much better at it than others, and some require using the blade which can eventually damage it. With folding knives, we prefer knives that can easily strike a spark from their spine while closed for safety reasons. We brought each knife with us on our camping and backpacking trips, and used them for daily activities for over a month. 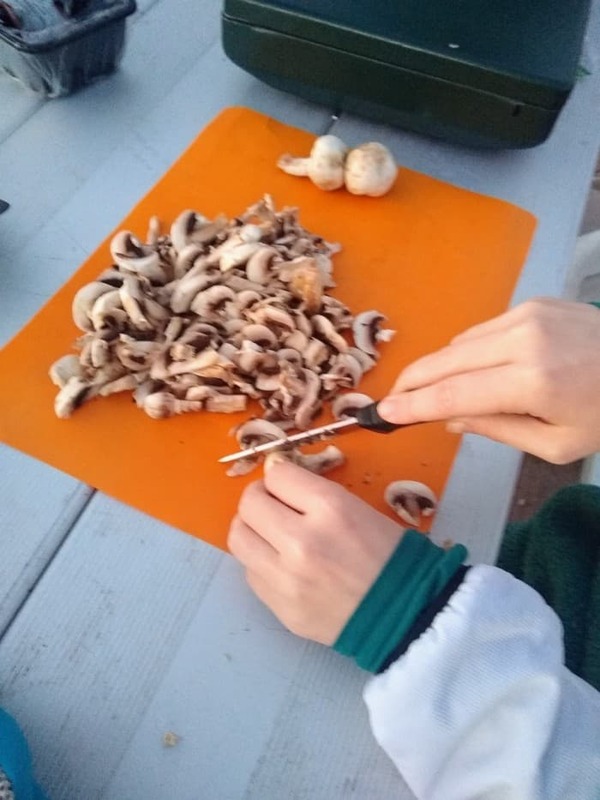 We made sure to spend time whittling wood, cutting cordage, and chopping food with each knife. Slicing up some camp dinner.